Please note that this letter to Steve was a device for reflection. It was not an attempt to communicate with Steve. 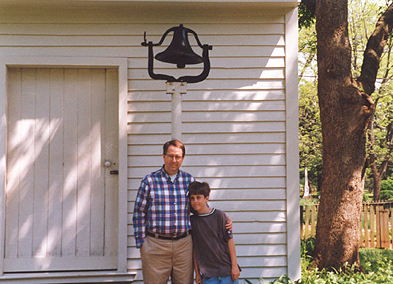 Under the Bell at the Sam Davis House, Smyrna, TN. It has now been seven months since your fatal accident on Thursday, February 8, 2001. As you know, your mother's birthday was Wednesday, September 12th. Preferring to celebrate on a week-end, we chose the preceeding Saturday to go to Nashville and the musical "West Side Story." The presentation was very well done, plus you would have loved all the humor and action. However, the play ended tragically. Tony and Maria were about to leave a world of gangs and violence to start a new life together. But as they ran to embrace one another, Tony was cut down by a bullet. As Tony lay dying, he and Maria bravely tried to sing the lyrics, "There's a place for us." But there would be no place for them. Tony died, and all the hope they had of a life together died with him. On Tuesday, September 11, 2001, the hope of many other Americans died, also, as our nation was attacked by terrorists. The twin towers of the World Trade Center are gone, a whole section of the Pentagon was destroyed, and four jet planes full of people perished. Many children sat at school waiting for parents who never returned. Parents paced the floor, hoping for news that their loved ones survived. Your mother and I share in their sorrow, the grief from losing you still painfully fresh. For many, hope perished in the smoke of the World Trade Center and the Pentagon. For their children, at least in this life, there would be no place for them. For them those lyrics, "There's a place for us," almost seem to mock them, knowing that their loved ones are gone. Steve, sometimes when I drive down our road towards our home, I catch myself looking off to the side, trying to spot a boy in an oversized black shirt, peddaling his bicycle as hard as he can, trying to beat me home. But just like the victims of that terrorist attack, your place in this life is gone. Oh Son, you are already there! Perhaps, by now you have already met some of the victims of the terrorist attack. Now all those people who knew Jesus as their Lord and Savior are safely home in heaven. To know Jesus is to be safe. To have Jesus as your Lord and Savior is to be able to look the terrorists in the eye and say, "Though you slay me, yet you cannot touch my soul. Though you destroy me in this place, there is another place, a better place, a place where you cannot go." Thank you Jesus. Thank you for going to prepare a place for us. Now, make us brave; give us courage as we face the days ahead. Amen.